Irish Family History: Ashes to Archives. To mark the anniversary of the destruction of the Public Records Office of Ireland on June 30 1922. We're giving you FREE access to our Irish Birth, Death & Marriage records from Thursday 27 June to Sunday 30 June. Make sure you visit findmypast.com.au between Thursday and Sunday to access these FREE records and uncover your Irish family history. 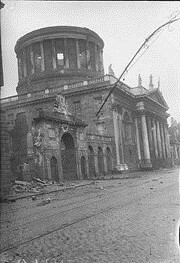 On 30 June 1922, during the Irish Civil War, the Public Records Office of Ireland, located at the historic Four Courts in Dublin, was severely damaged by fire resulting in the loss of a huge number of historical records. That event is seared in the minds of family historians worldwide as it has made Irish genealogy one of the most challenging but also one of the most rewarding family history pursuits. We mark the anniversary of this famous event by highlighting what was lost, what survived and what amazing alternatives are available to you when you are researching your Irish family history. Free access from 9am AEST, Thursday 27 June 2013.